ANOTHER SUCCESS FOR THE VICTORY PLAYERS . 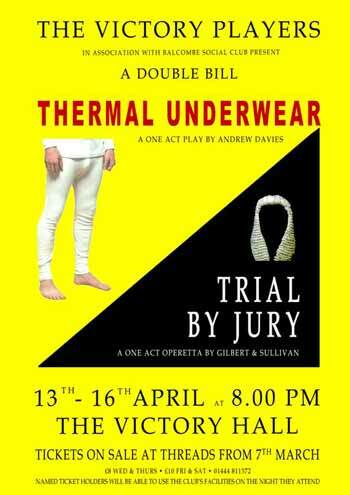 What a triumph the recent production by the Victory Players of Gilbert & Sullivan's comic opera 'Trial by Jury' turned out to be. The key singers were superb in both voice and acting: John Humphries as the Judge; Mike Rayner as the Usher; Angelina, the deserted bride sung by Charlotte Marshal! 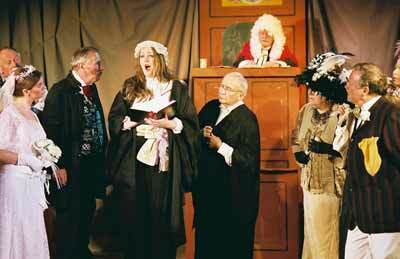 ; Jane Horrell as her Counsel; and Charles Metcalf as the bounder who finally saw his bride snaffled by the judge. What was also particularly noticeable was the obvious enjoyment of all the' other singers who not only sang well but acted their parts to perfection. The ensembles were extremely well handled. The difficult times for any actors are when the focus is not on them. But there was always some action and movement and stage 'business' going on which kept our interest very much alive. The costumes were terrific and Victorian tiered court room set by Richard Harris and John Randall just right. Congratulations too for the Director and conductor -Douglas Wragg and pianist David Moore. 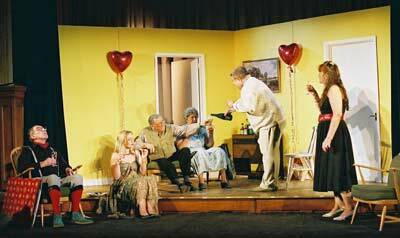 Preceding the opera was a whimsical one act play 'Thermal Underwear' by Andrew Davies, showing how a Ruby Wedding party can go disastrously wrong. Colette Randall as the daughter was wonderfully dismissive of everybody and clearly unhappy with both her parents (Jacqueline Kehoe and John Bunn) and her brother (Chris Walker) and flirty friend (Miranda Murray), but especially with ,her husband Bob (Rodney Saunders) who had her murder on his mind. The director was Glenys Harries-Rees. I hope it was. not a microcosm of life in general, as my wife and I only recently celebrated our Ruby Wedding! I 'would have preferred lightly more pace and movement to , the production at times, but the acting itself was excellent, and the whole short play amusing and enjoyable. It is encouraging to see the Victory Players flourishing in this way and we must not forget to thank Producer Rodney Saunders and his large team of production staff and the officers who help to make it happen. Programme for Thermal Underwear & Trial By Jury (PDF file, 554KB). To save, right click and select "save target as".